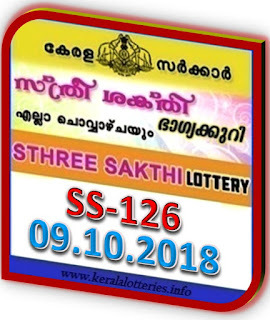 Kerala lottery result of "Sthree Sakthi (SS-126)" lottery on 09/10/2018 is published below in check easy format. 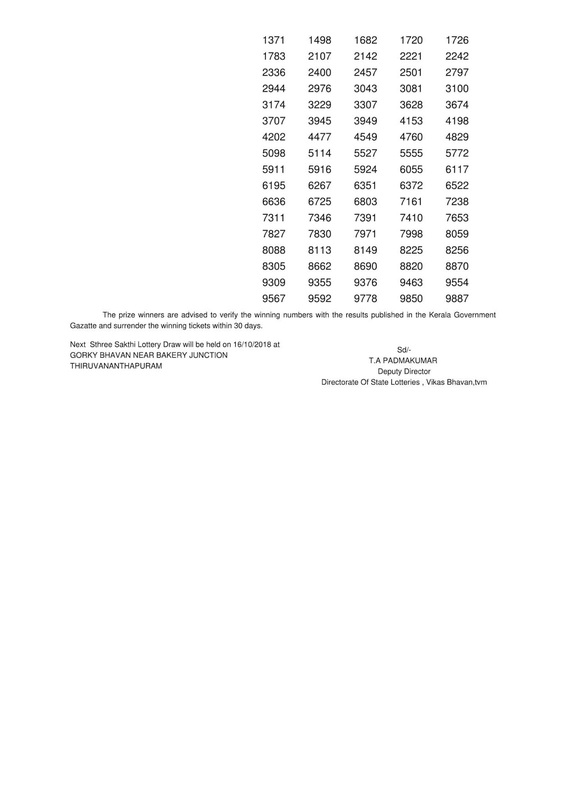 Sthree-Sakthi weekly lottery result is published on every Tuesday. Sthreesakthi SS 126 lottery will be drawn at Sree Chitira Home Auditorium, Pazhavangadi, East Fort, Thiruvananthapuram. The draw starts at 3:00 PM and the live Kerala lottery result shall be released by 3:03 PM. Official Kerala lottery result is normally released between 3:45 and 4:30 PM here. 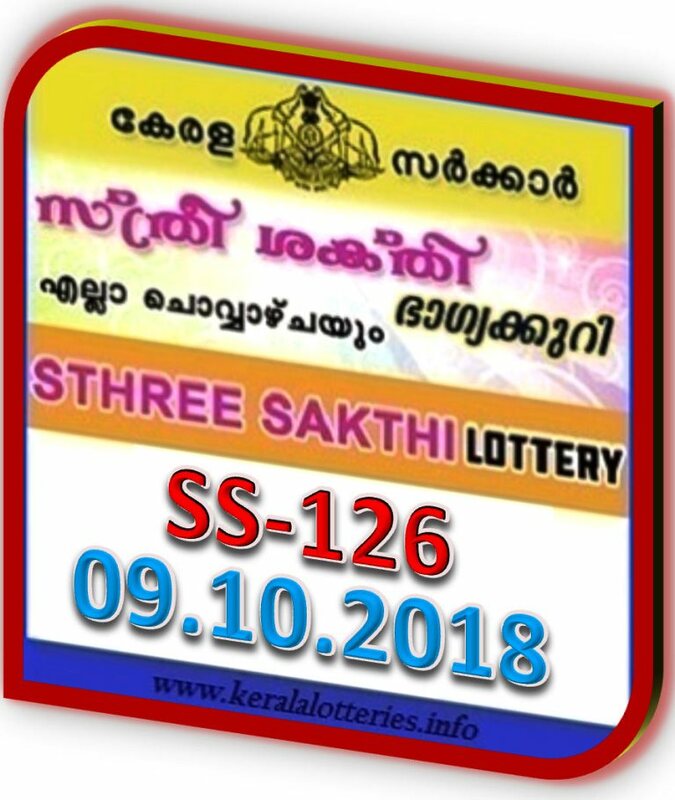 Today's Lottery Sthree Sakthi SS-126 drawn on 09 October 2018 costs Rs.30/- and are released in twelve series. The first prize will be Rs.50 Lakh (for one ticket common to all series), the second prize is Rs. 5 Lakh for one ticket again. 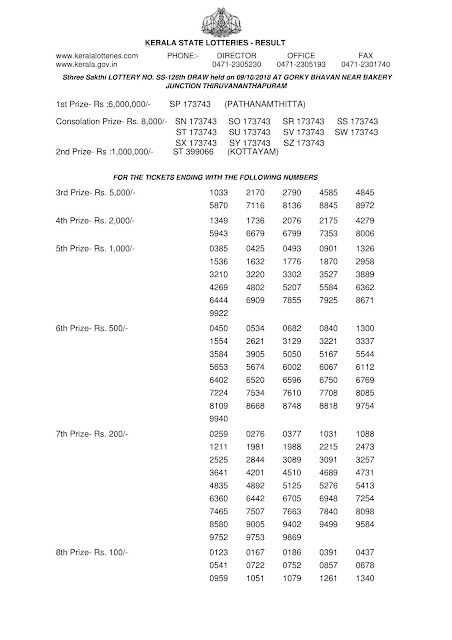 Lower slab prizes of Sthreesakthi-126 are from 3rd prize Rs.5000/- to 8th prize Rs.100/-. There are eleven consolation prize of Rs.8,000/- for the tickets matching the same number of first prize winning ticket of Sthreesakthi SS 126 but missing the series of the first prize winning lottery ticket. View the detailed prize structure of Sthree Sakthi SS-126 here.